While the majority of the high performance cars at the SEMA Show each year are rear wheel drive muscle cars, Ford helped to bring attention to the launch of the new Ford Focus ST with a quintet of tricked out front drive 5-doors that worked to show the aftermarket potential of this American hot hatch. The Ford Focus ST is truly a hot hatch with 252 horsepower, 270lb-ft of torque and a unique exterior package that makes this one of the more exciting 5-door models available in the US market but at the 2012 SEMA Show, five different design groups took this sporty hatchback a step further. The result is a group of Focus ST models that each offer their own unique look and level of performance ranging from mild to wild. The 2013 Ford Focus ST by Bojix Design takes closest attention to the exterior design and the handling of the sporty 5-door with the only drivetrain modification being a Bojix exhaust system. However, the handling and stopping power is improved with Eibach R1 coilovers, Eibach front and rear sway bars and an AP Racing front brake package with 4-piston calipers. The exterior of this Focus ST features a front splitter, rear wing and carbon fiber side splitters designed by Bojix Designs with Lamborghini Candy Orange Metallic paint and a carbon fiber patterned 3M wrap on the hood and roof. The exterior is finished off by a set of black Rennen Monolite M5 Mesh wheels wrapped in Continental DW tires. On the inside, Bojix has added Katzkin leather rear seats and floor/cargo mats from Lloyd’s Mats. The Ford Focus ST by Steeda Autosports offers slightly more performance with less appearance modifications inside and out. Steeda is best known for their handling goodies and this customized Focus ST build began with the Steeda G-Trac suspension system and a Brembo big brake package. Steeda then added an in-house cold air intake, a high flow turbo downpipe and a cat-back exhaust system to improve the power output of the 2.0L EcoBoost engine. In terms of appearance modifications, Steeda has added a rear spoiler, a graphics package and 19” HRE wheels wrapped in Nitto tires on the outside with an aluminum pedal set and a leather wrapped steering wheel setting off the interior. Galpin Auto Sports is best known for “pimping rides” on MTV but this SoCal custom shop turned their attention to the 2013 Ford Focus ST for the 2012 SEMA Show with the result being a hatchback that looks ready for the race track. Galpin began by improving the power output by adding a Borla exhaust system, a Steeda cold air intake with a K&N filter, a methanol injection system and a custom dyno tune injected by an SCT programmer. Next, the handling was improved with an H&R coilover suspension package, Steeda sway bars and a Brembo high performance braking kit featuring 4 piston front calipers clamping down on 14” rotors. Galpin then took to the outside of the Focus ST, adding a wide body kit that adds a unique widened front fascia with a deep chin spoiler along with flared front and rear fenders while a huge ARP rear spoiler hovers over the rear door – really cementing that ready to race look. Galpin then bolted up a set of lightweight Motegi wheels wrapped in Cooper Zeon RS3 tires and painted the entire car blue, white, grey and bright green. On the inside, Galpin has added custom leather door panels, shift boot, e-brake boot and a leather wrapped steering wheel. Next up is the 2013 Ford Focus ST Tanner Foust Edition designed by Global RallyCross champion, Ford driver and Top Gear USA host Tanner Foust. While there are appearance modifications inside and out including a Street Scene Equipment “Tanner Foust Edition” body kit featuring a new front chin spoiler, side skirts, custom grilles and a larger than stock rear wing along with Motegi wheels that also sport the Foust name. Inside, a Katzkin leather interior package, carbon fiber appointments and an upgraded sound system with help from Pioneer helps make the Tanner Foust Edition Focus ST unique. However, it is the drivetrain of this racer-built hatchback that truly makes this car special. Foust and his build team added a larger turbocharger, a new intercooler, a custom downpipe, MagnaFlow exhaust and the engine calibration to increase the power from 252 to 305 horsepower. Foust then added an ACT clutch and flywheel to help send more power to the wheels with Hankook Ventus tires providing the traction. Helping to improve the handling and braking of the Focus ST, the Tanner Foust Edition adds a KW/Tanner Foust suspension system featuring adjustable front struts, rear shocks and sway bars along with a Brembo big brake kit packing 14.4” front rotors and 4-piston calipers. Last and most certainly not least is the 2013 Ford Focus ST Cosworth CS330 built by the high performance experts at Cosworth and the gang from Ford Racing (shown in the large image above on the right). This vehicle features extensive exterior modifications to provide a unique look with drivetrain upgrades that make this the most powerful Focus ST at the 2012 SEMA Show. The Cosworth CS330 begins with the Focus ST 2.0L EcoBoost engine, adding a larger turbocharger, a larger intercooler, forged pistons, forged connecting rods, a high performance camshaft set and an ECU flash from Cosworth while Ford Racing added a cold air intake system and a high flow cat back exhaust system to help bring the total output of this sporty 5—door hatchback up to 330 horsepower and 323lb-ft of torque. Ford Racing Performance Parts including a coilover suspension system for improved handling and a big brake package with slotted rotors, high performance pads and stainless steel brake lines help to finish off the performance modifications made to the Cosworth CS330. That power is sent through the standard 6-speed manual transmission to the front wheels where lightweight Cosworth RS2000 wheels wrapped in Pirelli PZero tires help make the most of those 330 ponies. Once the drivetrain was taken care of Cosworth added the CS330 Edition body kit that includes an integrated front spoiler with carbon fiber ducts, side skirts, an integrated roof spoiler and a rear diffuser/fascia while painting pretty much everything in a high quality PPG Environbase Tangerine Scream paint scheme. The gallery above on the right side offers a quick look at each of the five Ford Focus ST hatchbacks and you can check those out by clicking any of the thumbnails above. 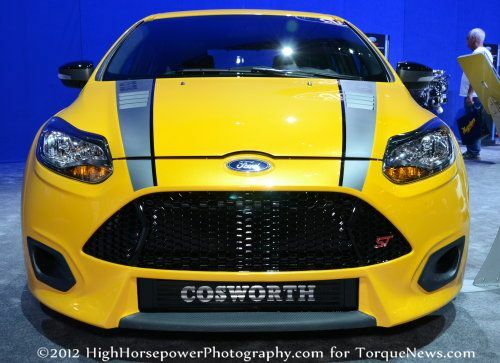 For a more in-depth look at these five Focus ST models from SEMA, click here to visit the TorqueNews.com Facebook page gallery with a variety of images of each one of these high performance American hatchbacks.